On Saturday (Feb 2) at Sulphur Springs City Park Pond, Peavine Pinion Pool located behind the Civic Center, it is the Larry Buster Memorial Sulphur Springs Kids’ Trout Fishing Day. The event, which is sponsored by the National Wild Turkey Federation, Texas Parks and Wildlife Inland Fisheries Division, the City of Sulphur Springs, local merchants, civic organizations and many individual contributors, will run from 10:00 am until 2:00 pm. Soft drinks and hot dogs will be provided by the Kiwanis Club of Sulphur Springs, and there will be drawings for door prizes for participating kids. 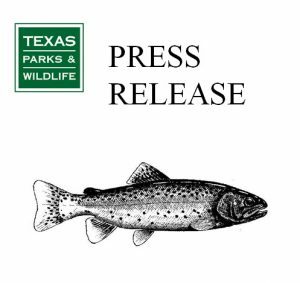 Kids of all ages are encouraged to bring their rods, reels and bait, to take a chance at catching some of the 2,000 rainbow trout that will be stocked by Texas Parks and Wildlife Department personnel. Whole kernel corn, Berkley power eggs, and trout bait, and small spinners are generally the favorite baits for trout. Because this event is sponsored in part by Texas Parks and Wildlife Department, there is a special exemption in effect during the fishing. Adults who are actively helping kids fish for trout are exempt from the standard license requirements during the event only from 10:00 am until 2:00 pm, Saturday (Feb 2). All other anglers are required to have a freshwater fishing license. There is no minimum size limit on rainbow trout, but there is a daily bag limit of five fish per person. For more information, call TPWD at 903-593-5077.